This is a perfect meal for one of those “running errands” days when you don’t have a lot of time to pull a meal together for dinner. 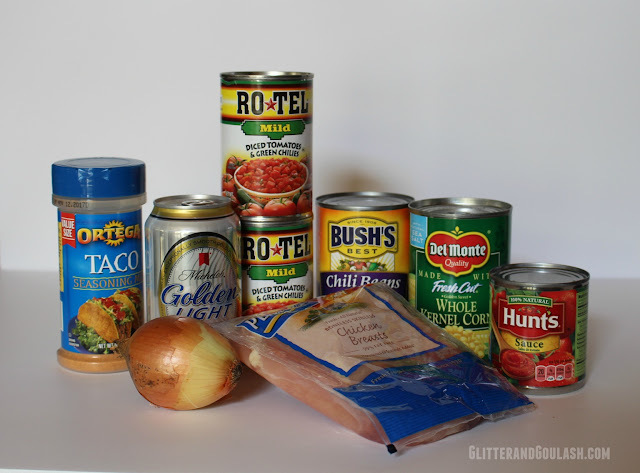 It doesn’t get simpler than this, Crock Pot Chicken Tortilla Soup. Simply open cans, dump in the crock pot, and walk away. Let the crock pot do all the work for you and you get to take all of the credit. And let me promise you, there will be many happy people in your family the night you serve this. The beauty of this recipe, beside the obvious benefit of not standing in front of a hot stove for hours, is that the ingredients are all stuff that you can keep stocked in your pantry. 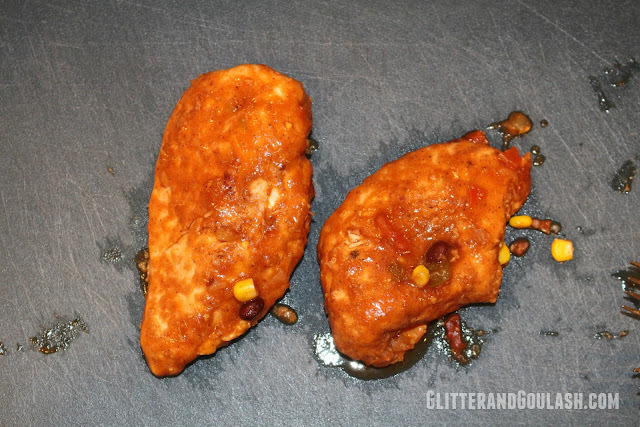 Thawing the chicken breasts is the only pre-planning that you need to do. Easy peasy……. 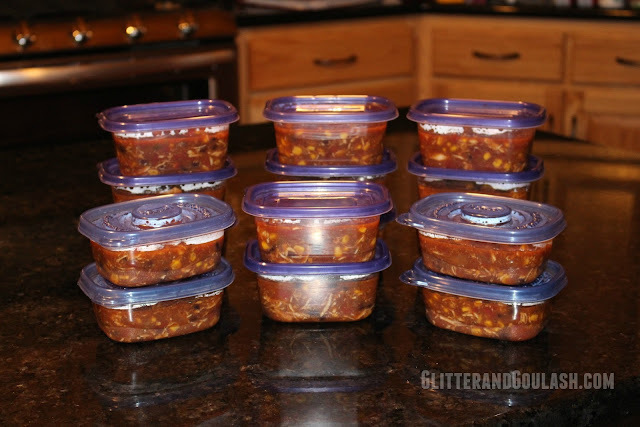 Stir all ingredients together so that the flavor combines completely and put lid on. 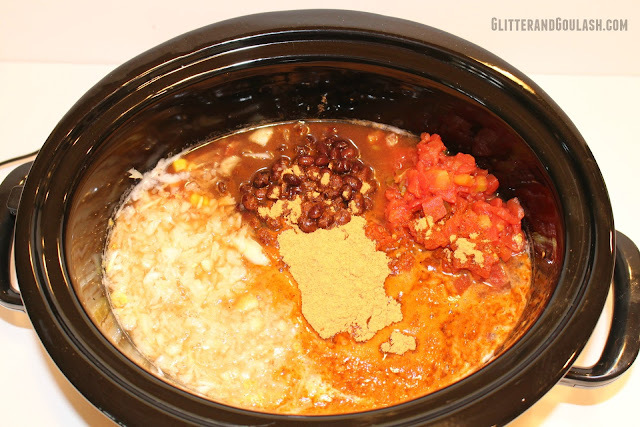 Turn the crock pot to “high” and let cook for 5-6 hours. 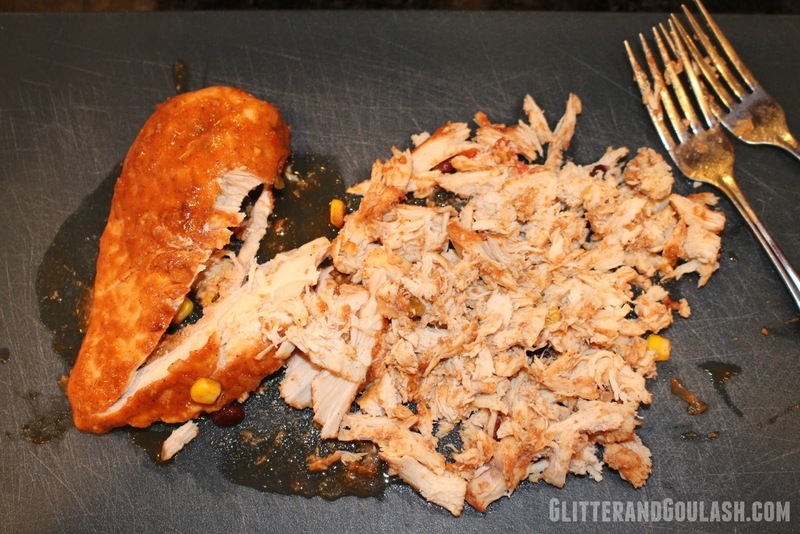 Once the soup has cooked for 5-6 hours, remove the whole chicken breasts and shred with two forks. 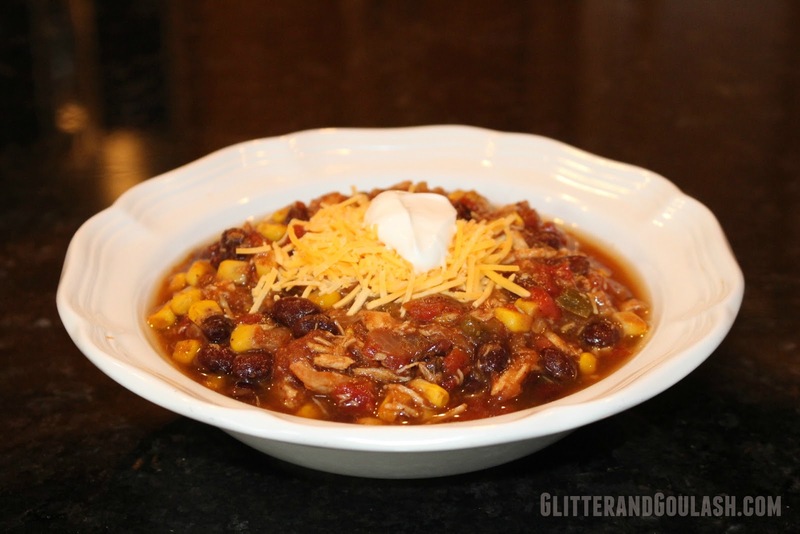 Return the shredded chicken to the crock pot, give another stir and dinner is ready! And there you have it…a hot, ready made, delicious meal to enjoy with minimal work! Top with shredded cheddar cheese and sour cream. 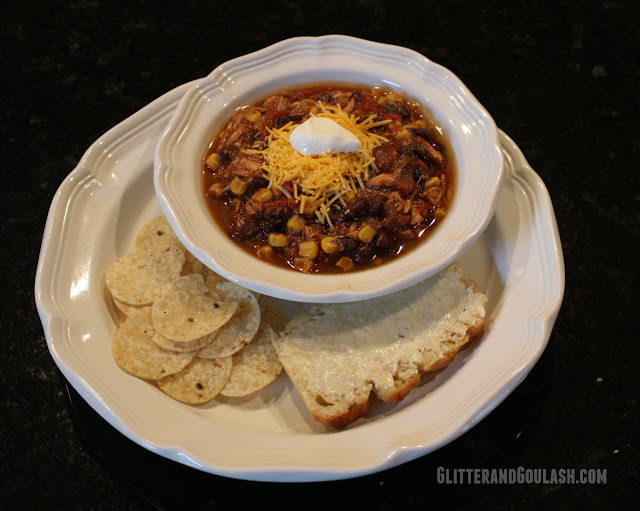 I also like to serve with some tortillas chips and a slice of warm Quick and Easy Beer Bread . These are both perfect for dipping into the soup. 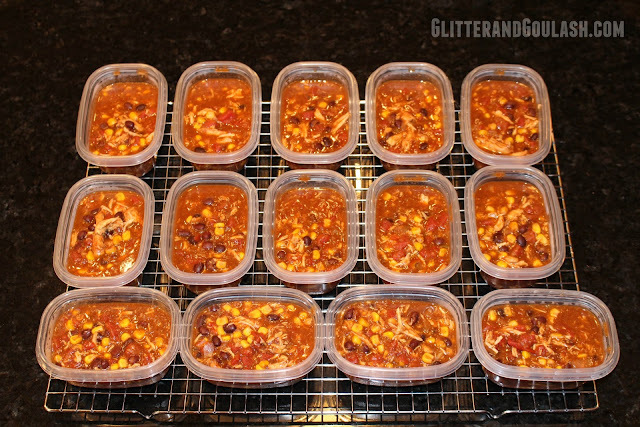 Extra Tip: My kids love this soup so much that I get a second crock pot going on the same day to make a second batch. The second batch gets divided into mini containers and frozen for school lunches. It only takes an extra couple minutes to double the batch and you will get 15-16 (using a 1 1/8 cup freezer container) school lunches out of it in return. Win-Win!!! When your child opens their lunchbox expecting another soggy sandwich, they will be delighted to see a thermos filled with a warm yummy soup! I put a little container of sour cream and shredded cheese in their lunch as well and they mix it when they are ready to eat, they love it! 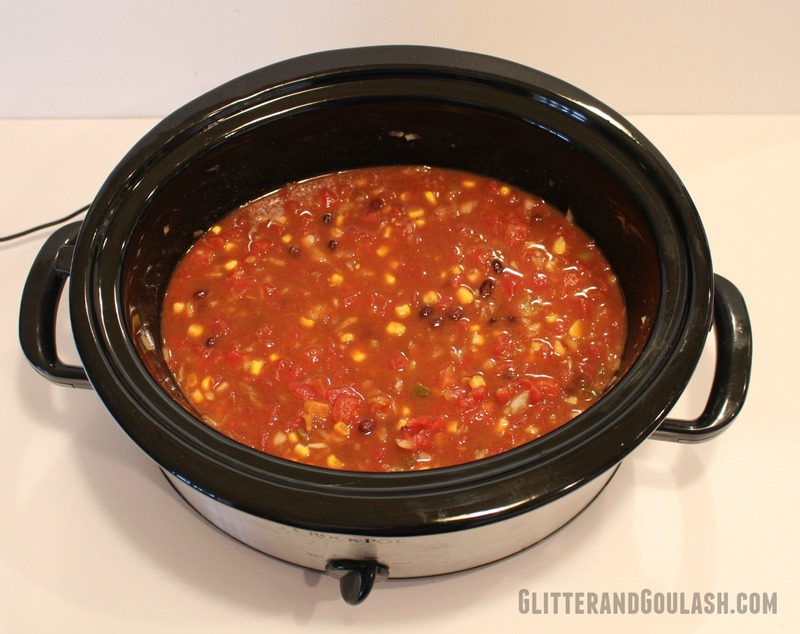 Place all ingredients in slow cooker, stir to combine, and cook on high for 5-6 hours. Shred chicken before serving and return to soup. Toppings: shredded cheddar cheese, sour cream, tortillas chips.